While assassins specialise in terminating their targets, they adhere to many of the same ethics and practices of other Bounty Hunters. They take their work seriously, avoid needless bloodshed, and honour their contracts to the letter. 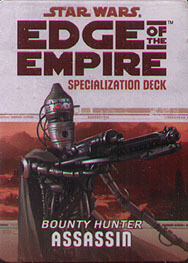 This deck requires the Edge of the Empire Core Rulebook and includes cards for all 20 talents available in the Assassin specialization.